When I was growing up, Christmas was always an exciting time as I eagerly awaited that moment when we got to open our presents. Most people remember a special gift that they were thrilled to receive, but, in my case, one of my most vivid recollections is the rather disappointing gift I received one year. Let me begin by clarifying that my mother was a wise woman when it came to gift giving because she always seemed to find the perfect gift for us kids without our having to hint or leave wish lists lying around. But when I was 15 years old, she somehow got it wrong, or so I thought. That Christmas Eve as I tore off the wrapping paper on the big box with my name on it, I was surprised at how light the package felt. I soon discovered why – it was filled with paper to disguise the true gift concealed within. Nestled deep within its confines was a much smaller box which I quickly realized could not, in any way, contain the items I had been hoping for. 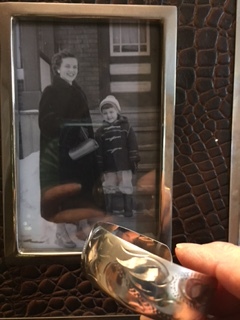 My precious bracelet with a picture of my beautiful mom and me when I was four or five years old. I slowly unwrapped the little box and inside was a delicate, silver bracelet with graceful etchings on its surface. Even at my young age, I could detect that this was a finely crafted piece of jewelry, but it wasn’t the leather fringed vest or some other piece of clothing that I really desired. I couldn’t believe that my mom had completely misjudged what I wanted and needed! But when I looked up, I saw her lovely face eagerly waiting for my response, so I faked a smile, hugged her, swallowed my disappointment, and thanked her and dad for the gift. I think I wore that bracelet only a couple of times before putting it back in its box and relegating it to a corner of my dresser drawer. I’m sure my mom noticed that I never wore it, but she said nothing. Maybe she was having her own doubts about purchasing it. For the next couple of decades (yes, decades), that bracelet was packed up with my other belongings whenever I moved and travelled with me, but it remained in its box, unnoticed and forgotten. Then one day as I was cleaning out some cupboards, I found the tiny box tucked away in the far corner. I opened it and there sat the bracelet. It was tarnished but its beauty was still evident. I took it out, regarded it closely, then shone it up and placed it on my wrist where it fit perfectly. What struck me most about it was how beautiful but unpretentious it was, and for the first time I understood what had drawn my mother to it. I wore it that day and have worn it almost every day since. Years later my mom was battling cancer and she had lost a significant amount of weight which meant many of her beautiful clothes no longer fit and even her lovely bracelets were too loose for her thin, small wrists. I felt so helpless at not being able to alleviate her situation. But one day when I was visiting her, I suddenly had an idea. I took off my precious bracelet, put it on her wrist and, because of the nature in which it had been made, it nestled in and fit perfectly. I told her to keep it and wear it, and I would take one of her other pieces. She looked rather wistful at my offer, but I think I must have looked rather eager to find some way to please her, because she smiled and agreed. Maybe she didn’t want to disappoint me, much in the way that many, many years before, I had not wanted to disappoint her. She wore that bracelet a few times, but when she fell quite ill and it became apparent that she was probably not going to get better, she gave it back to me. “This is yours and I want you to keep it. I’m glad you like it so much,” she told me. And so, 45 years after first receiving it, the bracelet came back to me, but under much different circumstances and received with a much more appreciative attitude. I continue to wear the bracelet almost daily and it continues to keep my mother close to me. In the end, it was the perfect gift, even though at the time I could not begin to fathom how precious and dear that thoughtful gift would become. Sometimes those who know us best, know what’s best for us! And that’s truly the most precious gift any of us can ever hope to receive! Previous Previous post: Home Renovations – Beautification or Aggravation? Next Next post: New Year, New Intentions, New Beginnings!